By Dennis W. Viau; an original recipe. 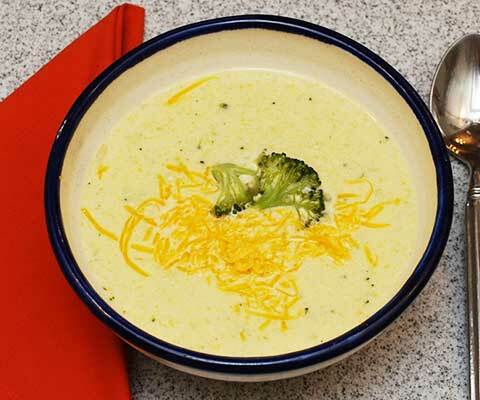 When I was doing research for my Cream of Broccoli Soup, I saw several recipes for the soup made with added cheddar cheese. I liked the idea; so I modified my original idea for this recipe. The soup is delicious, and it's keto friendly. Melt the butter in a large saucepan. Add the chopped onion and broccoli. Sauté over medium heat until softened, about 8 minutes, stirring often. Add the stock and season with pepper. Place a couple of floret bunches on top (optional). Bring the pot to a boil, cover, and reduce the heat to low. Simmer 10 minutes or until the broccoli stem pieces are tender when pierced with a fork. Remove from the heat. Using a slotted spoon or tongs, remove the cooked florets and set aside. Allow the mixture to cool to a safe temperature to handle, especially if you will be using a glass blender jar. Pour the ingredients in the jar of a Vitamix (or other) blender and cover. Starting at low, blend, increasing the speed to high to purée the soup, 10 to 20 seconds or until smooth. Add the cream and blend. Taste and adjust for salt. Note: You can use an immersion blender to purée the soup right in the pot, but it won't be as smooth as when blended in a Vitamix.